Acer brought the Predator Gaming After Party to PAX West 2018. Hosted at The Showbox near Seattle's Pike Place Market, guests, VIPs, and press were able to grab a few drinks, dance to live music, play games, and go hands-on with the latest hardware to hit the Acer Predator gaming line. The full day of events kicked off right on the PAX West show floor with the Predator Street Team. Cosplayer Arcanine Rawr sported the custom Acer Predator cosplay as the team explored the convention center and allowed attendees to take photos, get an invite to the after party, and grab some Predator swag. The street team also gave away VIP passes to the Predator Gaming After Party via a social giveaway for those Predator fans that followed the hashtag #PredatorPAX. The giveaways didn't end there. Attendees could also participate in the Predator AR experience displayed throughout the convention center for a chance to win a Orion Battlestation worth $10,000! The Showbox opened its doors later that night giving guests access to the Predator gaming lineup, game demos, and a night of drinks, music, and giveaways. Guests got their hands on Orion 9000 desktops running on Predator X 34 G-SYNC ultra wide monitors, the Trition 700 laptop, the special edition white and gold versions of the Helios 300 laptop, and more. The Play-like-the-Pros esports competition pit gamers' Rocket League skills to the test for coveted prizes. 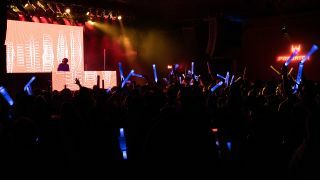 DJ A-TRAK closed out the night with a live performance followed by the final giveaway winner announcements that included the Predator Helios 500 and Trition 700 laptops. Thanks to all who attended the Predator Gaming After Party at PAX West 2018! See you next time!